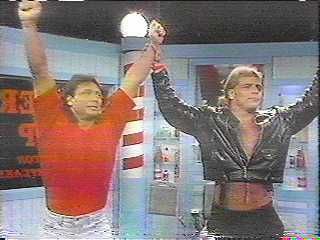 Remember the last time the Rockers were together? Well, I experienced something one last time today. After 13 years, I am finally done. Yes, today I just finished my last day of high school and will be graduating 3 days from now (5/27/2001). Me, like everyone else has been looking forward to this day. You always wanted to get out of school, get away from the long research papers, semester finals, and all the rules. But its not until the last winding hours that you realize all the good stuff you miss. This whole week I've been pumped for finishing school. Anticipating the end of my 13 year road of education. I was excited that I was finally done with homework, I was excited that I didn't have to deal with the dumb school rules anymore, I was excited I get to start a brand new life pretty soon. But all that changed on the last day. The day started off as usual, going to school in the morning at 8am with my usual first hour being a free hour, and just bumming around the school library like I usually do every day. Then I started to realize something, this will be the last time I see the library in my high school after going there for 4 straight years, this is the last time I'll be seeing my librarian, Mr. Rennick, playing on his computer all day long. Right then I decided to cherish that day, and go along and do anything I can to relive all my past memories of my school I forgotten for one last time! First off, I went down to that damn school cafeteria, and for one more time I had those delicious breakfast bagels that I loved. I then shortly had my first class, and we just watched tv all hour, and my classmate next to me who half the time I talk to, and half the time I watch fall asleep, went to sleep all hour. But he awoke during the final minutes and we talked about our future plans. He simply said, "I'm going to become an Alcoholic" (He told me his grandma is getting him a keg for his open house, what a grandma!). Right after he said that, realizing It'll be a long time before I see him again, I just said, "Have a good life" and he just said "yeah" as he was walking away. The same thing happened to my Literature teacher who was practically tearing up wishing us her goodbyes. I then went to my computer class where my best friend sat next to me, and he did what he always did during that class, which is falling asleep on the keyboard. I had the next hour off with him, and we went to the school parking lot so he could get his usual cigarette. Some other guys from school came around and we chatted for a little while before going back to lunch. After lunch I had my Government class, and we had a little test. And after that my teacher said his goodbyes, and so did the rest of my Senior classmates who I'll most likely will never see again. I was off to my Algebra 2 class afterward, and their was only one other Senior in the class with me, the rest were Juniors. We had to take our damn Final Test early since we were graduating ahead of our classmates. We both finished around the same time, and our sub teacher said we could go early, and all the other Juniors in there were like "you guys are seniors!?!?!?" and we're like "yeah," and one gal was like "good luck with your future" and they were all looking at me, and even though they seldom talked to me in class, I could tell they were gonna miss me. I spent the next few minutes talking to that other senior about how hard that damn test was, wished him luck in the future, and went to the deli to get one last Gatorade. The Lunchlady thought I wasn't a senior, and when I told her I was, she stood there dumbfounded with a big smile across her face, and this just made me worse saying goodbyes and all. I then went to my final class, which was German 2. Everyone in there was Sophomores, but they all talked to me in there and I got along with them well. There was one other Senior in there, and Ironically enough, he was the same one that just about killed me in a car accident 2 years ago. (I was a passenger in a car with him, and he lost control of the car on a gravel road, and it flipped 4 to 5 times into a ditch, docs said we would've had 0% chance of living if we wouldn't of worn seat belts) Well we had to give some final presentation and after that, we just talked to all the other kids, and there was this one kid I always joked with every single day, and he said "Bye Dale" and I just waved to him and said "C ya later" and I knew I was gonna miss that little ****er, and I knew he was gonna miss me too. After the final bell, all the seniors were gathered around their lockers talking to each other like it was their last time together. Even though they knew we had graduation ahead of us, this was really our last TRUE day together in school. I grabbed my **** out of my locker, said a couple more goodbyes, and left that school for good, never looking back, and realizing that all the good things from their are now over like talking to great friends who I mostly only see in school, the excellent meals at the deli, and the horrible jokes of the teachers. I know for most of you who graduated, you musta felt like this too on your last day. And for those of you who didn't graduate, I can relate, well, that is, if you're a wrestling fan. Everyone use to love WCW, it killed the WWF in ratings from mid 1996 until early 1998. And the past 2 years, all the stuff it's been giving out has been mostly crap. Everyone hated it, but when we found out just 2 months ago that the WWF bought out WCW, we were shocked. All us old WCW fans then all of a sudden forgotten the hatred towards WCW, and tuned in to watch the last TNT version of Nitro, realizing that most of the wrestlers on that program we won't see again in the WWF's relaunch of WCW. And we started to remember all the good things of WCW like all the high flying cruiser weights who gave there hearts out in every match, and risked their lives and suffered many injuries and rarely made it to the top level, we also remember all the legends of WCW who are Ric Flair, Booker T, Diamond Dallas Page, and Sting. And when we witnessed that last much of Sting vs. Ric Flair, and I bet all the Internet marks were ballin they ****ing eyes out realizing that it was all coming to an end.